A new report by the US Bureau of Labor Statistics is being mistakenly interpreted as showing that startups are creating fewer jobs. This view somehow manages to completely ignore those odd things investors call ‘exits’. In computer games, being ‘owned’ (spelled ‘pwned’) is the term for being beaten or killed by another character in the game, something which even non-computer-game-playing innovation investors would recognise as a mark of catastrophic failure. In the world of startup investment, however, a world where IPOs are mostly considered to be a thing of the pre-bubble-burst-era, the achievement of getting your venture owned (i.e., acquired in an M&A deal) is recognised as a mark of consummate entrepreneurial success. The following table, derived from the US Labor bureau report figures, shows the startup job market being ‘pwned’, but in a way which totally disregards jobs created by startups which have actually become owned. The rest of this article is devoted to explaining why that table is not a representative guide to the impact of startups upon job creation. If the only jobs which startups were responsible for creating were the jobs within startups themselves, prior to the startup being acquired, this conclusion would be realistic. However, what if a significant proportion of the new jobs being created in established businesses were also created as a direct result of startups being acquired by those businesses? 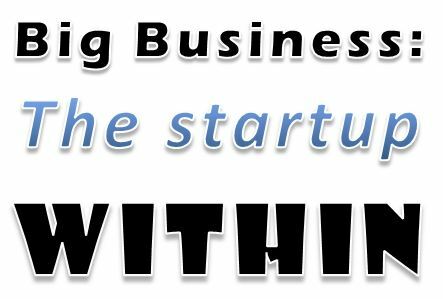 The reason for a startup being acquired is almost universal, which is for it to be ‘scaled up’ by the new owner. As notable startup guru Steve Blank so regularly reminds us, what VCs are looking to invest in is a scalable startup, one that provides such a huge (I hate using the word ‘obscene’ in this context) return on investment that it outweighs all the losses that the rest of the startups in that investor’s portfolio might possibly generate. The typical reason behind such a vast appreciation in value (that this kind of return would represent) would be derived from some very substantial market opportunity that the startup’s innovation efforts would have successfully uncovered. The substantial capital required to exploit this opportunity is what the new owner of the startup brings into play after they have acquired it. At this point, the number of jobs needed to scale up the startup would appear on the business plan that represents the implementation of the new (ex)startup owner’s intended large-scale operation. The number of staff in question would almost inevitably very seriously exceed the number employed in the startup at the time of acquisition, usually by at least one order of magnitude, more likely by two orders and occasionally (especially if the startup was still very small, e.g., ‘founders only’) by as much as three orders of magnitude. At this later ‘scaled up’ stage, if the number of jobs created were to be included in a survey of job creation, they would not be attributed to a startup, but to the new owner, which would more than likely be a large and long-established business. But without the startup, there is no reason to believe those jobs would have been created. In the old days, innovation was expected to have come from inside of large companies R&D laboratories, and any large number of new jobs, associated with any burgeoning new lines of business and their sizeable new operational establishments, would have come from those internally-sourced innovations. But as Clayton Christensen indicated in The Innovator’s Dilemma, investors and industry analysts have in recent years lost much of their (previously unshakeable) confidence in the ability of large organisations to successfully introduce any kind of innovation which disrupts those organisations’ own markets and results in dramatic growth and commensurate increases in workforce numbers. Large organisations are now consequently actively seeking out startups as external sources of innovation (a practice that Henry Chesbrough calls Open Innovation). So any survey which seeks to determine the impact of startups upon job creation, cannot restrict itself to numbers which simply compare the numbers of jobs created at startups with those created in large organisations. Hardly any of these jobs would necessarily appear as having been created at startups on a survey of job creation. Even such operations as small bars and shops (responding to secondary employment opportunities arising from startup scaling) will in many cases be new outlets of small businesses but nonetheless these could quite easily be long established operations rather than startups, but their headcount increases would in the cases described above be startup-derived, despite appearing on job creation surveys as being jobs created at established businesses). It is common practice to include secondary employment in the assessment of the impact of new business operations, but hitherto, startups, due to their inherently extremely small size are rarely, if ever, seen as being responsible for a significant amount of secondary employment (except perhaps collectively, when the impact of startups is considered in ‘startup locales’ such as Silicon Valley) but this convention inevitably fails to take ‘post scale-up employment impact’ into account once the startups are no longer startups or the staff involved are not startup staff. In fact, the more successful startups are going to be at ‘getting themselves owned’, the smaller the proportion of newly created jobs that startups will appear to have, as higher and higher numbers of newly created jobs ‘start to go back to appearing under the larger established company rosters’ (after the recent brief period of seemingly untrammelled startup proliferation) as a result of new, startup-originated (but subsequently exited, acquired and scaled-up) operations where the jobs in question will not be ‘at startups’. Until the proportion of jobs created by large organisations (both inside and outside those organisations) as a direct result of startup activity is clearly determined, the balance between the sources of job creation (i.e., between established businesses and startups) will remain essentially unclear and speculative. If, over time, large organisations ultimately come to rely (as The Innovator’s Dilemma predicts) almost exclusively upon startups for their innovation (perhaps as a result of shutting down their own internal R&D labs and moving to exclusively embrace Open Innovation) and that this is responsible for almost all of their resulting job creation, then statistics reporting the sources of job creation which do not reflect this explicitly will produce an entirely unrepresentative picture, which would show only a limited proportion of new jobs resulting from startups and the vast majority coming from established businesses, whereas in fact the reality would be the precise opposite. If this were to be the case, the role that startups will come to play in the workforce of the future will be at serious risk of being significantly underestimated and forward-looking policy will not be formulated in a way which will engage with the full scope of the opportunities which startups may ultimately represent. Should the UK government convert student debt into startup equity? Will continuous brain scanning implants make jury trials unnecessary?